Location: North 61:43.888, East 009:27.209 (GPS at the summit). 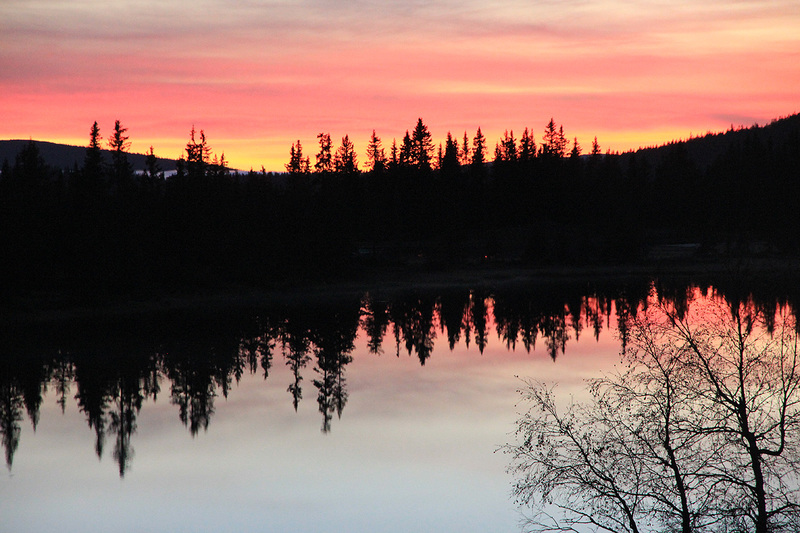 Driving north from Lillehammer on E-6, you shall turn off onto Hwy. 257 at the small place Sjoa. There is a gas station right ahead and your turn is just before. Measure from here. At approximately kilometer 4.7, look for a road going right with the sign Øverbygdsveien, take this road. The road climbs, at kilometer 8.0, take a sharp right onto the road Espesetervegen. At kilometer 8.7, you arrive at a self serve payment of toll. (Just before a cattleguard) Pay (2010) NOK 20 for a regular car. This road may be a bit marginal, in particular, just after heavy rain. At kilometer 10.9, keep left. The road ends at kilometer 11.3, there is a place to turn around. Just before the end of the road, there is parking for 2 cars on the right hand side. This location is N61:42.586, E009:28.246, elevation about 916 meter. This is a reasonable trailhead. The map may show some trails and there are indeed some vague trails. However, the best approach is to bush walk directly uphill from this trailhead. 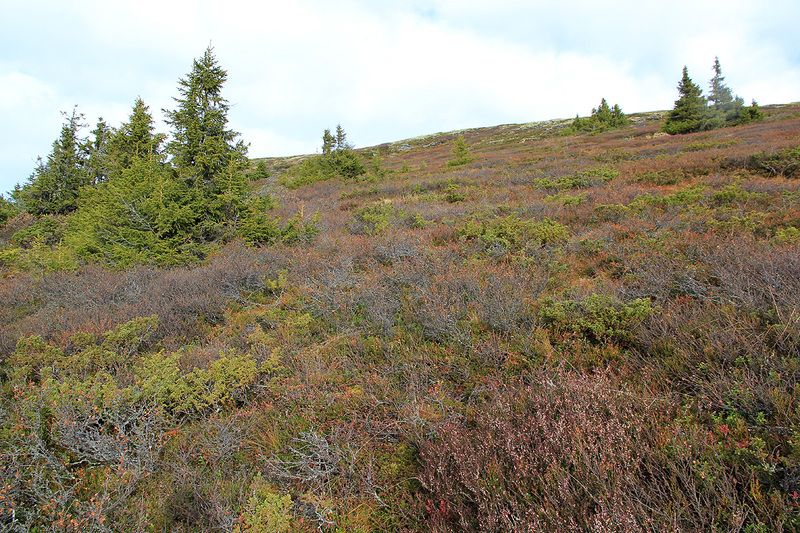 Follow small open passages between the trees, it is not very far, about 300 meter, and you are above treeline. 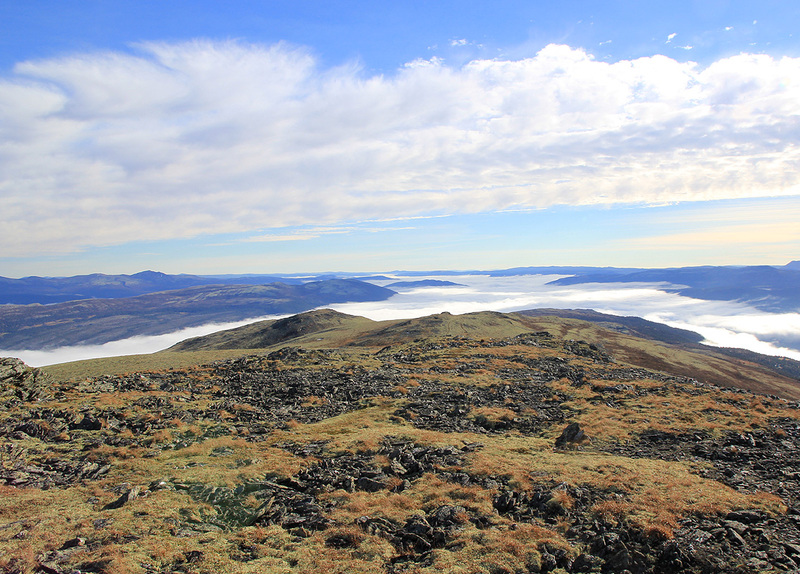 The summit will now be to the north (left). The nicest route is perhaps to continue uphill and gain the main (north-south) crest. One can then follow a small trail going north to the summit. Alternatively, just angle uphill while steadily moving north. 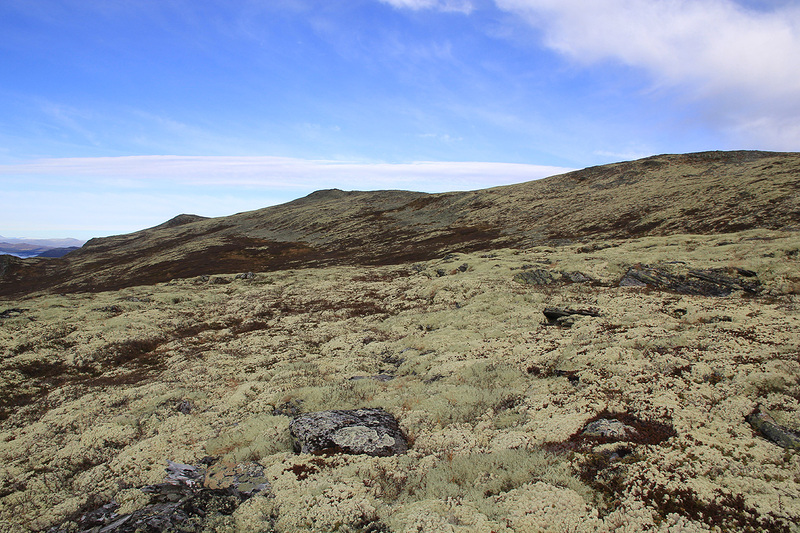 The terrain is easy, the lower part of the mountain is covered by low vegetation, while the higher parts have a carpet of (reindeer) lichen. There are two summit points, very close together and of approximately the same height. 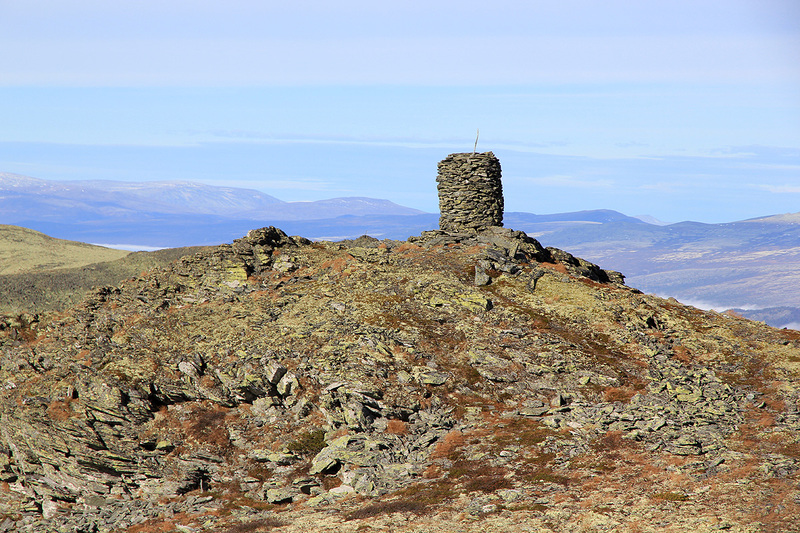 The northernmost has a big cairn, while the south summit has a (fallen down) trigpoint marker and an iron bolt. The south summit has coordinates N61:43.858, E009:27.264, it measured marginally higher on my GPS. 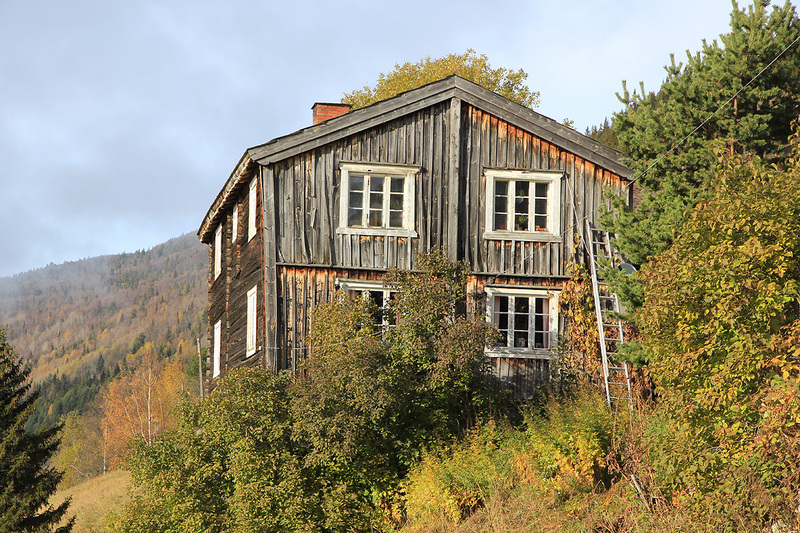 After climbing Skaget on Friday, I drove to my mountain hut and made preparations for the coming winter. 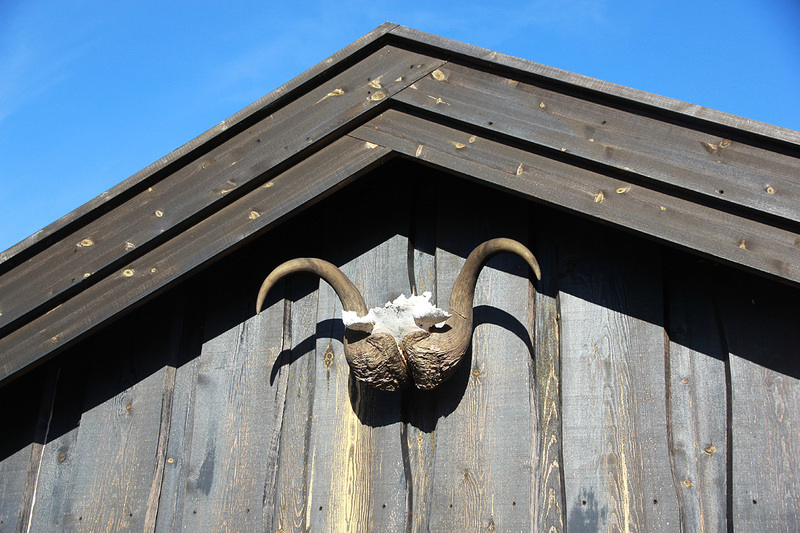 The "skigard" (fence) needed a few small repairs and the day was sunny and unseasonably warm. Lunch outside in the sun. The evening came with a display of red colors. Later, I had dinner by the fireplace and listened to the radio as Norway defeated Cyprus in a football qualifying match. 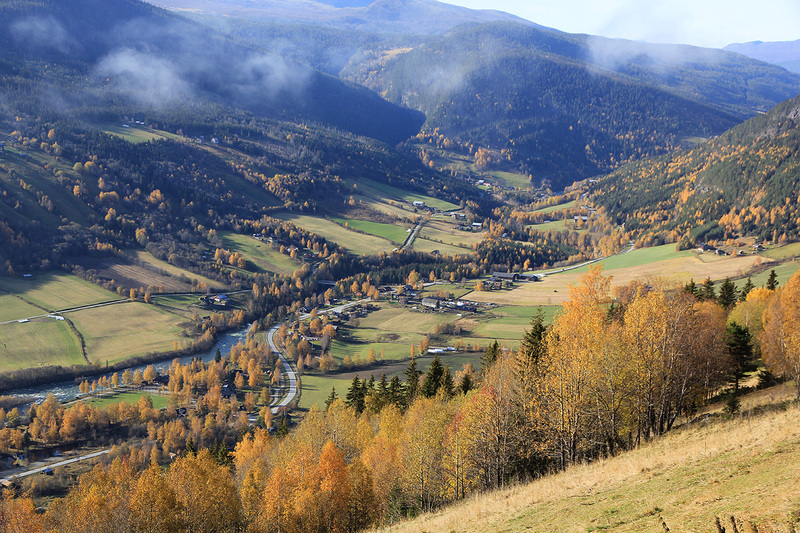 The next morning, after a tasty breakfast, I finished the winter preparations, then drove via Lillehammer to the trailhead. 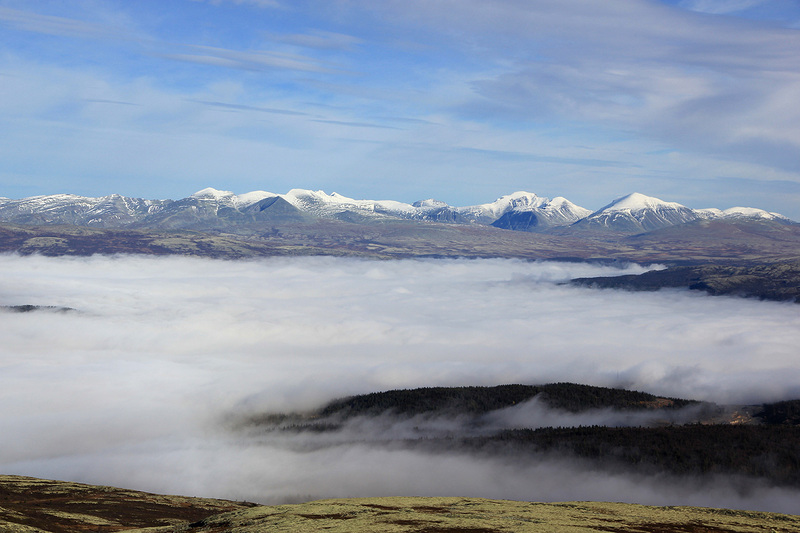 All valleys had a pretty dense cloud cover, that lasted all day while the mountains enjoyed the October sun. 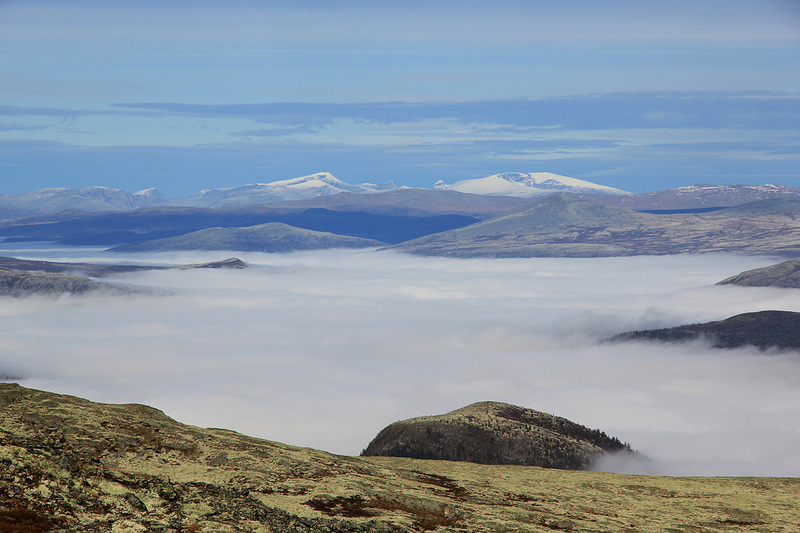 The trailhead was already above the clouds and I had a good view across to Jotunheimen. I started out at 1150 and tried to follow a trail that sort of traversed north in the hillside. Very wet and very obscure, I soon decided to just head uphill in order to get above the treeline. This was a very smart move and the rest of the hike was very nice. 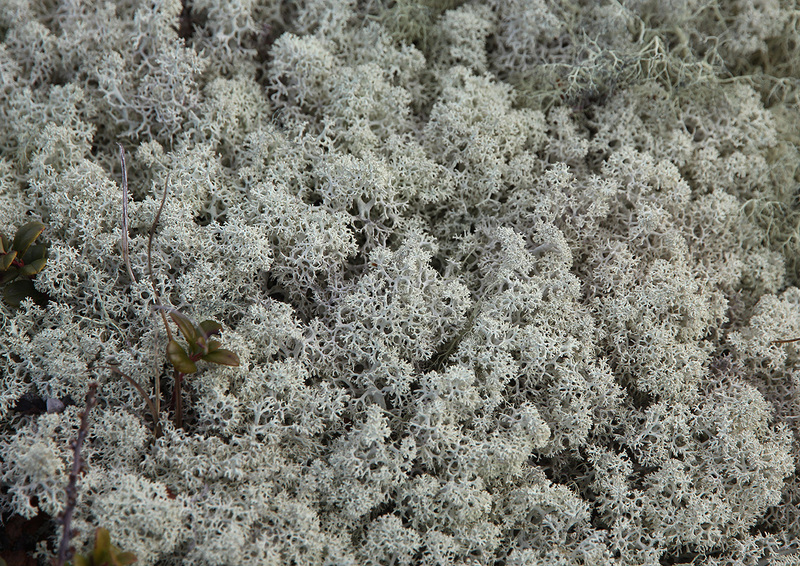 The sloping mountain dressed in fall colors, low brush, then white lichen higher up. A soft carpet to walk on. I made the main crest, then followed it north towards the summit, arriving there by 1245. There are two small summits of essentially equal height. 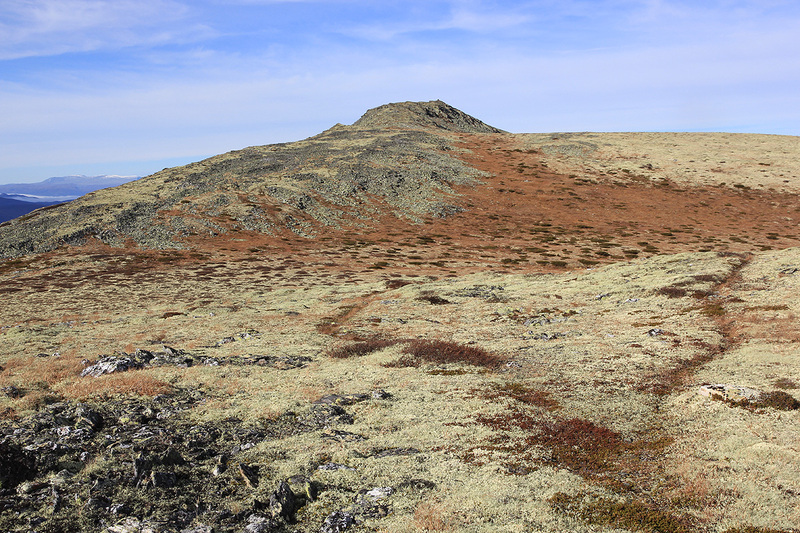 I measured both, took my panorama picture from the southernmost (since it did not have a cairn), then a "Kvikk lunch" chokolate by the cairn. 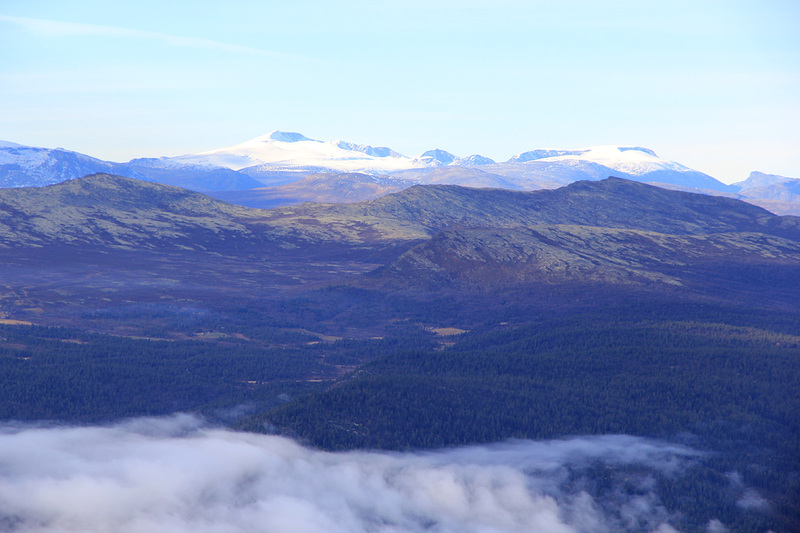 The view east to Rondane was outstanding. 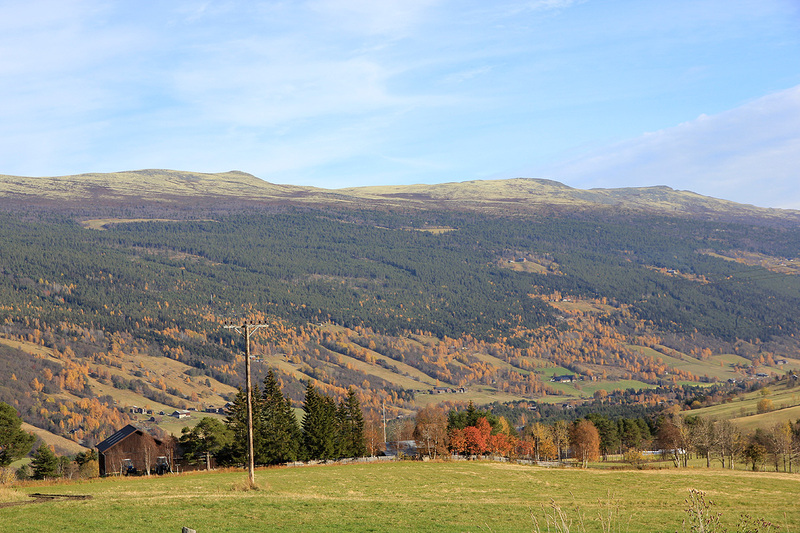 To the west, the big bulk of Heidalsmuen, then eastern parts of Jotunheimen. Dovre was also quite visible to the north. I left around 1305 and followed the main crest southwards a bit further before turning west and descending. 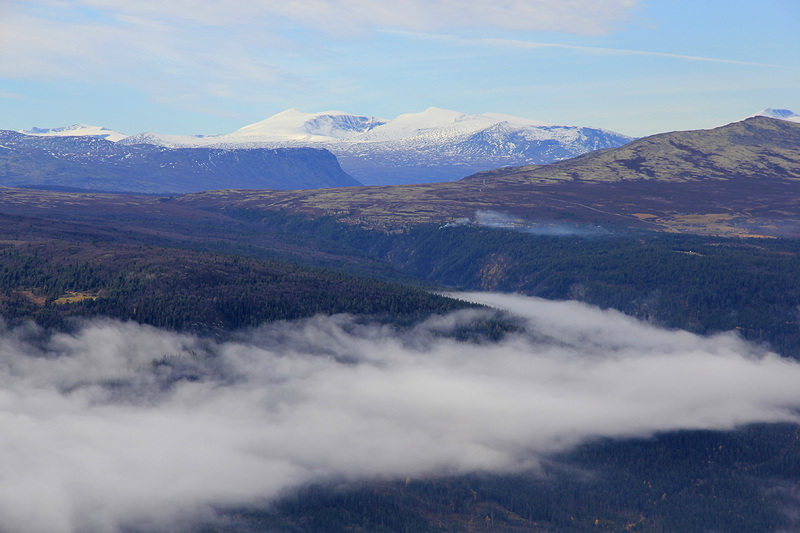 The entire Gudbrandsdalen valley covered by clouds going south. In fact, these clouds never went away and provided a nice setting for the mountains all around. I was back by the car in about 45 minutes, a very nice hike altogether. I completed this smaller road going high in the west slope, with a good view of the valley, by driving to the centre of Heidal. 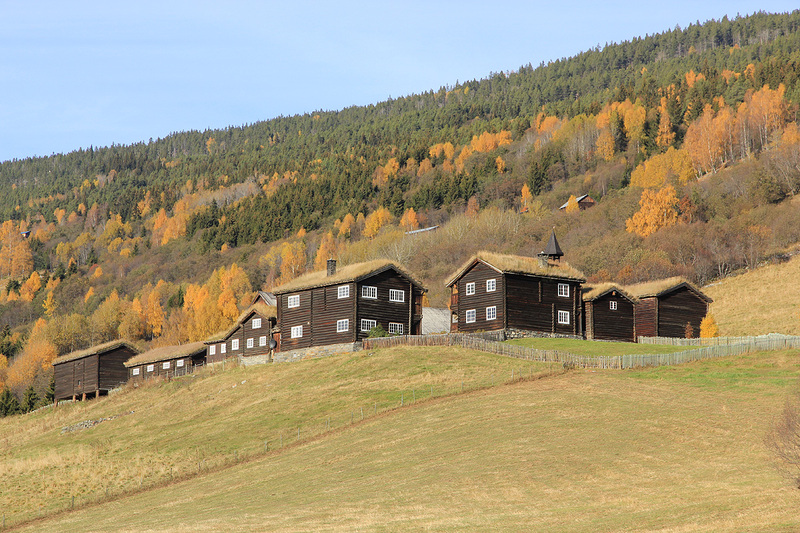 Many old farm buildings along the way and some very well kept farms in the valley itself. My trip continued across Strynefjellet where I took the old road, a very nice alternative to long tunnels. 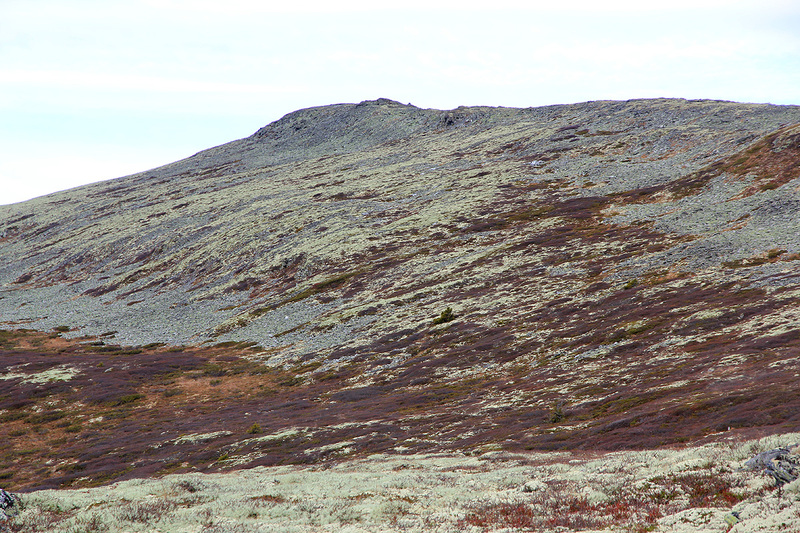 Svartkampen, north and south summits (view east). Panorama I, west, Heidalsmuen and Jotunheimen.